Latin Touch Meat Guide Pork: Part Two - Latin Touch, Inc. In part one, we looked at how to know how much pork to serve, the basics of cooking, brining pork, and tips for perfect pork chops. Now let’s look at some larger cuts: tenderloin, pork loin roast and, of course, pork shoulders! The tenderloin refers to the Psoas major muscle along the central spine portion, which hangs between the shoulder blade and hip socket. This is the tenderest part of the animal, because these muscles are not used for locomotion. If you like pork chops, you’re going to like pork tenderloin as it’s similar in flavor and texture, especially when brined. Because it’s thicker than cut chops, it can take on more flavor from brines and marinades. It’s also easier to achieve a nice medium to medium rare (which is perfectly safe) and still get a good sear on the outside. When shopping the meat counter, pork tenderloin is often confused with pork loin roasts, but the loin roast is a significantly larger cut, while tenderloin typically weighs around a pound, meaning it cooks much, much faster. 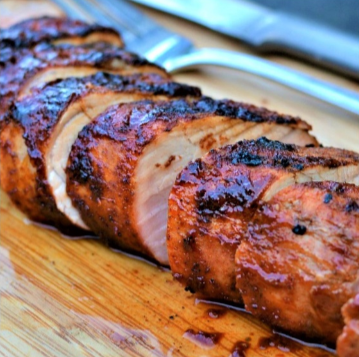 Pork tenderloin is a fantastically versatile cut of pork that can be marinated in a short amount of time, and can go from marinade, to grill, to plate in less than forty-five minutes. Take the tenderloin(s) out of marinade or brine (rinse if brined) and let rest on the counter for 30 minutes. Brush your grill-top(s) with oil. Set the tenderloin over direct heat, cover and cook for 10 to 12 minutes, turning every couple of minutes, until the meat reaches an internal temperature of 140F. Take the tenderloin off the grill, set it in a heavy foil boat, add any reserved marinate (not brine) and fold up the edges. Let the meat rest for at least ten minutes, then remove to the cutting board and slice into 2-3 inch rounds. 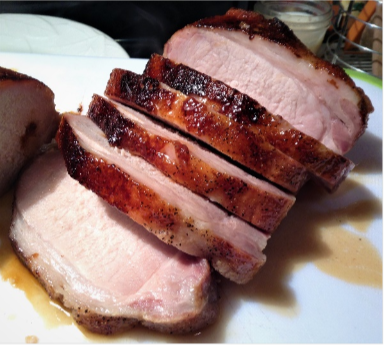 Pork loin roasts are one of my favorite budget-friendly cuts for feeding a lot of folks! The loin roast is a little fattier (though still lean) but identical in flavor. Pound for pound, is cheaper than tenderloin, as well. Loin roasts can be bought as boneless or bone-in and are usually in the two to four-pound range. Don't be intimidated by this bog roast cut, it’s just as easy to grill or roast as tenderloin, it’s just bigger and takes a little longer to cook. Pierce the roast every few inches with a knife, all the way around; add roast to marinade or brine and turn to coat. Cover with plastic wrap, and chill overnight, turning several times. Remove roast from marinade (rinse if brined) and pat dry. Sprinkle generously with salt and pepper (or just pepper if brined). Tie the roast every few inched with kitchen string, for even thickness. Set up you roasting box for 2-Zone grilling, with a space wider than the roast in the middle. Set the roast on the grill-top(s) directly over coals, tented with heavy foil, 5 minutes on each side or until browned. Transfer roast to indirect zone, cover loosely with foil, and for an hour or until a meat thermometer inserted into thickest portion registers 150F. Remove loin from grill, and let it rest 10-15 minutes before slicing.